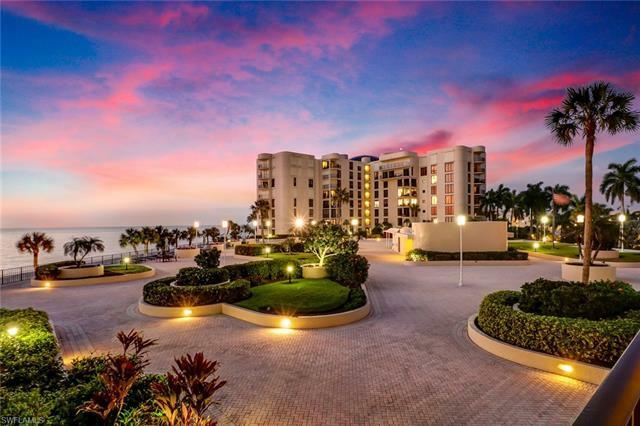 Located in the Moorings, one of Naples most prestigious communities, Lausanne offers resort style amenities including an expansive elevated pool and sun deck with direct access to 600 ft of beach front and front seat view to some of the most amazing sunsets. Amenities include fitness center, social room with full kitchen, game room, card and billiard room, beach chairs and umbrellas, Wi-Fi, and more. This two bedroom, two and half bathroom unit offers exceptional open space "but is in need of updating". An opportunity to create an interior that you choose vs paying top market price that leaves you compromising on your living style or purchase as a rental / investment opportunity! Enjoy front seat views on your couch or on your open air extended terrace that is accessed from 2 sets of hurricane proof double sliders. The view from this condo overlooks the expansive, elevated pool area that is known to provide the most beautiful views of the Gulf of Mexico. One deeded parking space on the upper level of secure garage & storage unit is included. Naples living at it's best...Make this your home on the Gulf! LOCATION! LOCATION! LOCATION! Call today for a private showing!